Faster than a TIE-Fighter, more powerful than a Gundark and able to leap tall AT-ATs in a single bound. It's "Super-Wook!" Wait, what? What springs to mind when you think about Star Wars: The Force Unleashed? Secret apprentices? Darth Vader? Maybe that level with the Star Destroyer? But what you probably don't think of is a wookie superhero, but you might have, had certain folks at LucasArts had their way. 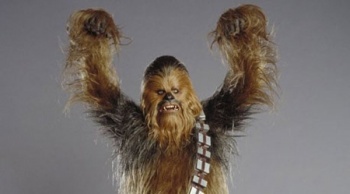 "At one point we were kicking around an idea where you were playing a wookie," said LucasArts veteran Haden Blackman. "It was going to be a big open world, and you'd be running around, and you'd be able to grab the heads of AT-STs and throw them at stormtroopers ... It was a very over the top-style superhero game." Sadly "Mega-Bacca" or whatever he might have ended up being called, was never to be, and the idea was shot down by none other than George Lucas himself, as Blackman relates: "He just looked at me and said, 'I just spent the last half hour talking to you about the importance of characters talking to each other, and you pitch me a game idea where the main character can't talk?" It's probably for the best that the game never got made, but it's certainly an entertaining to think about, and who knows, maybe one day "Wookstar" will get to fly.